Recognising that many graduates will work away from their jurisdiction of law study, this text focusses on the generic principles that underpin civil procedural theory across Australia. Using the SA procedural experience, the text engages students in a practical and critical understanding of the way court rules operate, in a dynamic environment. The text focusses on fairness, the exercise of discretion, and the ethical forensic use of court process to achieve effective and affordable outcomes for clients. Â The authors do not focus on â€œknowing the rulesâ€, but on being able to locate, interpret, apply, and work adaptively within a rules based system. This active and functional approach ensures that students will be able to transfer learning in this subject across jurisdictions and professional contexts in the future. Â Alternative Dispute Resolution is as much a part of civil dispute management as court process. Skills in conflict management, dispute resolution, and dispute system design, will be an important attribute that graduates will take into professional life. The text considers diverse aspects of dispute resolution theory practice and skills, both within and outside the court system. 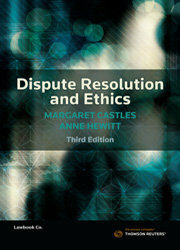 Extracts from Bobette Wolskiâ€™s important Legal Skills text provide integrated insight into the dynamics of dispute resolution and ethical practice in the modern professional world. Â The text forms the basis of an integrated and intensive learning experience that engages students in a series of practical exercises and will result in functional and critical competence in the diverse skills needed in this complex area.